Entanglement Giant Inflatable Twist Game - "Simon Sez" on a giant inflatable game board. Available from Talk of the Town for game rentals in the Washington DC, Maryland and Virginia Metro Area. Entanglement - "Simon Sez" on a giant inflatable game board. Twist and turn your body according to the attendant's commands. 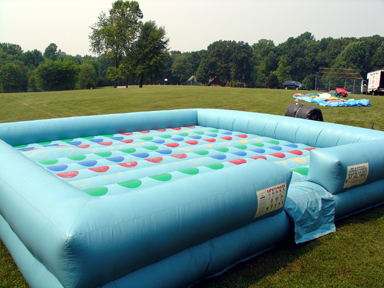 Up to 12 participants can play at once, making it a great addition to any party. Includes: inflatable, 1 blower, command board, and 1 attendant.